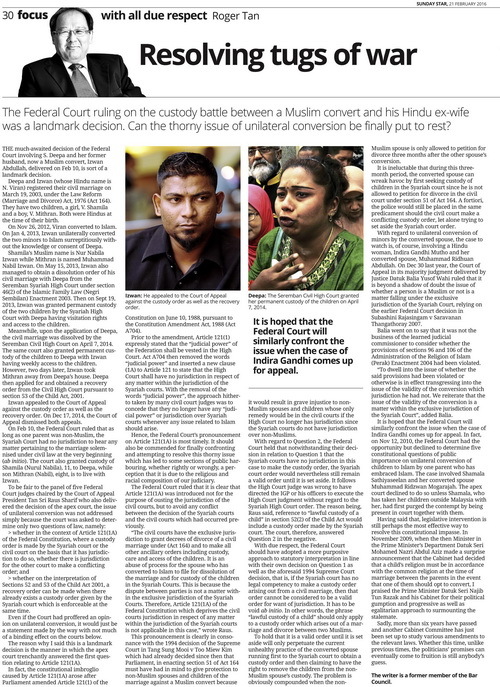 The Federal Court ruling on the custody battle between a Muslim convert and his Hindu ex-wife was a landmark decision. Can the thorny issue of unilateral conversion be finally be put to rest? The much-awaited decision of the Federal Court involving S. Deepa and her former husband, now a Muslim convert, Izwan Abdullah, delivered on Feb 10, is sort of a landmark decision. Deepa and Izwan (whose Hindu name is N. Viran) registered their civil marriage on March 19, 2003, under the Law Reform (Marriage and Divorce) Act, 1976 (Act 164). They have two children, a girl, V. Shamila and a boy, V. Mithran. ­Both were Hindus at the time of their birth. On Nov 26, 2012, Viran converted to Islam. On Jan 4, 2013, Izwan unilaterally converted the two minors to Islam surreptitiously without the knowledge or consent of Deepa. Shamila’s Muslim name is Nur Nabila Izwan while Mithran is named Muhammad Nabil Izwan. On May 15, 2013, Izwan also managed to obtain a dissolution order of his civil marriage with Deepa from the Seremban Syariah High Court under section 46(2) of the Islamic Family Law (Negri Sembilan) Enactment 2003. Then on Sept 19, 2013, Izwan was granted permanent custody of the two children by the Syariah High Court with Deepa having visitation rights and access to the children. Meanwhile, upon the application of Deepa, the civil marriage was dissolved by the Seremban Civil High Court on April 7, 2014. 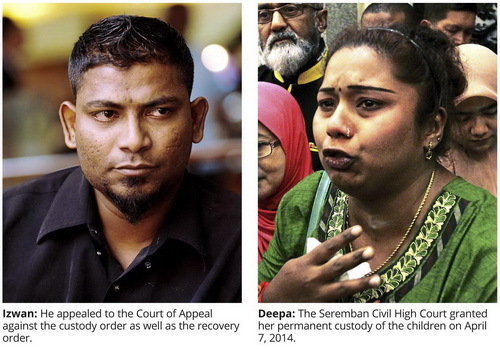 The same court also granted permanent custody of the children to Deepa with Izwan having weekly access to the children. However, two days later, Izwan took Mithran away from Deepa’s house. Deepa then applied for and obtained a recovery order from the Civil High Court pursuant to section 53 of the Child Act, 2001. Izwan appealed to the Court of Appeal against the custody order as well as the recovery order. On Dec 17, 2014, the Court of Appeal dismissed both appeals. On Feb 10, the Federal Court ruled that as long as one parent was non-Muslim, the Syariah Court had no jurisdiction to hear any matter pertaining to the marriage solemnised under civil law at the very beginning (ab initio). The court also granted custody of Shamila (Nurul Nabila), 11, to Deepa, while son Mithran (Nabil), eight, is to live with Izwan. > whether on the interpretation of Sections 52 and 53 of the Child Act 2001, a recovery order can be made when there already exists a custody order given by the Syariah court which is enforceable at the same time. Even if the Court had proffered an opinion on unilateral conversion, it would just be a statement made by the way with not much of a binding effect on the courts below. The reason why I said this is a landmark decision is the manner in which the apex court trenchantly answered the first question relating to Article 121(1A). In fact, the constitutional imbroglio caused by Article 121(1A) arose after Parliament amended Article 121(1) of the Constitution on June 10, 1988, pursuant to the Constitution Amendment Act, 1988 (Act A704). Prior to the amendment, Article 121(1) expressly stated that the “judicial power” of the Federation shall be vested in the High Court. Act A704 then removed the words “judicial power” and inserted a new clause (1A) to Article 121 to state that the High Court shall have no jurisdiction in respect of any matter within the jurisdiction of the Syariah courts. With the removal of the words “judicial power”, the approach hitherto taken by many civil court judges was to concede that they no longer have any “judicial power” or jurisdiction over Syariah courts whenever any issue related to Islam should arise. Hence, the Federal Court’s pronouncement on Article 121(1A) is most timely. It should also be commended for finally confronting and attempting to resolve this thorny issue which has led to some sections of public harbouring, whether rightly or wrongly, a perception that it is due to the religious and racial composition of our judiciary. The Federal Court ruled that it is clear that Article 121(1A) was introduced not for the purpose of ousting the jurisdiction of the civil courts, but to avoid any conflict between the decision of the Syariah courts and the civil courts which had occurred previously. “The civil courts have the exclusive jurisdiction to grant decrees of divorce of a civil marriage under (Act 164) and to make all other ancillary orders including custody, care and access of the children. It is an abuse of process for the spouse who has converted to Islam to file for dissolution of the marriage and for custody of the children in the Syariah Courts. This is because the dispute between parties is not a matter within the exclusive jurisdiction of the Syariah Courts. Therefore, Article 121(1A) of the Federal Constitution which deprives the civil courts jurisdiction in respect of any matter within the jurisdiction of the Syariah courts is not applicable in this case,” wrote Raus. This pronouncement is clearly in consonance with the 1994 decision of the Supreme Court in Tang Sung Mooi v Too Miew Kim which had already decided since then that Parliament, in enacting section 51 of Act 164 must have had in mind to give protection to non­-Muslim spouses and children of the marriage against a Muslim convert because it would result in grave injustice to non-­Muslim spouses and children whose only remedy would be in the civil courts if the High Court no longer has jurisdiction since the Syariah courts do not have jurisdiction over non-­Muslims. With regard to Question 2, the Federal Court held that notwithstanding their decision in relation to Question 1 that the Syariah courts have no jurisdiction in this case to make the custody order, the Syariah court order would nevertheless still remain a valid order until it is set aside. It follows the High Court judge was wrong to have directed the IGP or his officers to execute the High Court judgment without regard to the Syariah High Court order. The reason being, Raus said, reference to “lawful custody of a child” in section 52(2) of the Child Act would include a custody order made by the Syariah court. The court, therefore, answered Question 2 in the negative. With due respect, the Federal Court should have adopted a more purposive approach to statutory interpretation in line with their own decision on Question 1 as well as the aforesaid 1994 Supreme Court decision, that is, if the Syariah court has no legal competency to make a custody order arising out from a civil marriage, then that order cannot be considered to be a valid order for want of jurisdiction. It has to be void ab initio. In other words, the phrase “lawful custody of a child” should only apply to a custody order which arises out of a marriage and divorce between two Muslims. To hold that it is a valid order until it is set aside will only perpetuate the current unhealthy practice of the converted spouse running first to the Syariah court to obtain a custody order and then claiming to have the right to remove the children from the non­-Muslim spouse’s custody. The problem is obviously compounded when the non-­Muslim spouse is only allowed to petition for divorce three months after the other spouse’s conversion. It is ineluctable that during this three-month period, the converted spouse can wreak havoc by first seeking custody of children in the Syariah court since he is not allowed to petition for divorce in the civil court under section 51 of Act 164. A fortiori, the police would still be placed in the same predicament should the civil court make a conflicting custody order, let alone trying to set aside the Syariah court order. With regard to unilateral conversion of minors by the converted spouse, the case to watch is, of course, involving a Hindu woman, Indira Gandhi Mutho and her converted spouse, Muhammad Ridhuan Abdullah. On Dec 30 last year, the Court of Appeal in its majority judgment delivered by Justice Datuk Balia Yusof Wahi ruled that it is beyond a shadow of doubt the issue of whether a person is a Muslim or not is a matter falling under the exclusive jurisdiction of the Syariah Court, relying on the earlier Federal Court decision in Subashini Rajasingam v Saravanan Thangathoray 2007. Balia went on to say that it was not the business of the learned judicial commissioner to consider whether the provisions of sections 96 and 106 of the Administration of the Religion of Islam (Perak) Enactment 2004 had been violated. “To dwell into the issue of whether the said provisions had been violated or otherwise is in effect transgressing into the issue of the validity of the conversion which jurisdiction he had not. We reiterate that the issue of the validity of the conversion is a matter within the exclusive jurisdiction of the Syariah Court”, added Balia. It is hoped that the Federal Court will similarly confront the issue when the case of Indira Gandhi comes up for appeal. In fact, on Nov 12, 2010, the Federal Court had the opportunity but declined to determine five constitutional questions of public importance on unilateral conversion of children to Islam by one parent who has embraced Islam. The case involved Shamala Sathiyaseelan and her converted spouse Muhammad Ridzwan Mogarajah. The apex court declined to do so unless Shamala, who has taken her children outside Malaysia with her, had first purged the contempt by being present in court together with them. Having said that, legislative intervention is still perhaps the most effective way to resolve this constitutional impasse. In November 2009, when the then Minister in the Prime Minister’s Department Datuk Seri Mohamed Nazri Abdul Aziz made a surprise announcement that the Cabinet had decided that a child’s religion must be in accordance with the common religion at the time of marriage between the parents in the event that one of them should opt to convert, I praised the Prime Minister Datuk Seri Najib Tun Razak and his Cabinet for their political gumption and progressive as well as egalitarian approach to surmounting the stalemate. Sadly, more than six years have passed and another Cabinet Committee has just been set up to study various amendments to the relevant laws. Whether this time, unlike previous times, the politicians’ promises can eventually come to fruition is still anybody’s guess.